PUDA is stands for “Punjab Urban Planning & Development Authority”. 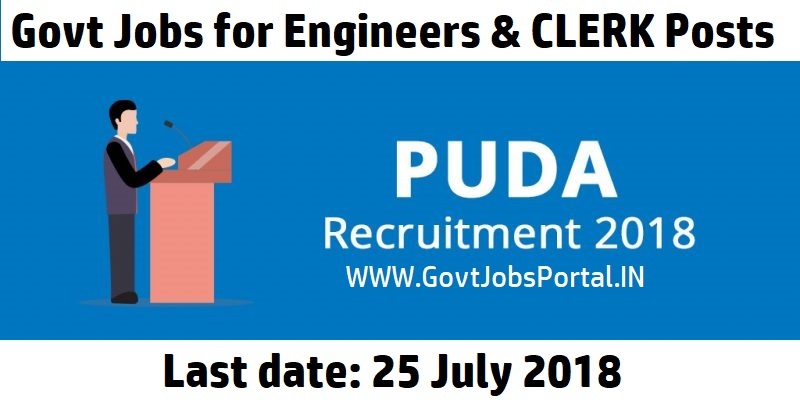 PUDA Recruitment department is going to filling up Engineers, Clerk and other Posts. PUDA is inviting online Government job applications from all interested & eligible candidates to apply for these Government jobs. PUDA Recruitment department issued this information in a PDF file and publish that PDF file on their official website. We are explaining this article on the basis of that PDF file only. The source of information for writing this article is that official PDF file only. We also share the reference links below under IMPORTANT LINK section. For more information read this article carefully. Age Bond: Those who wants to apply this PUDA Recruitment process must have age in between 18-37 years. What is the Application Fee for applying this PUDA Recruitment? Those who belongs to the following category “SC/ST/BC/OPH/Ex.SM” have to pay Rs.500; while all other cat. Candidates have to pay Rs.1000 as their application fee. How to Apply for this PUDA Recruitment 20128? Those who satisfied all eligibility condition can apply for this PUDA Recruitment 2018. The process for applying is online through the PUDA official website. The link is active on 9th July 2018 for applying online. The last date is 25th July 2018 for applying online for this PUDA Recruitment 2018. 9th July 2018 is the Starting Date to apply. 25th July 2018 is the Last Date.